Albert Trapmann was a Capt. / Adjutant with the 26th Middlesex and then the 25th London (Cyclists) Battalion. Albert Trapmann was born on the 15 Sept 1876. He was the son of William Hume Trapmann, a merchant, born in Charleston, South Carolina. William's father Lewis was born in Germany [1850 US census]). In the 1911 census Albert gives his birth place as South Kensington, however there is no matching birth registration, however there is a registration for a William Trapmann in the right year, so it is possible that he was registered using his last christian name [GRO Ref Kensington Dec Q 1876 Vol 1a Page 168]. His family were resident at 29 Roland Gardens, South Kensington in the 1901 & 1911 censuses. He first married Irene Maggiolini S'carampi Di Mombercelli in 1909 in Hastings at which he described himself as "Of Independant Means" [GRO Ref Hastings, Sussex Jun Q 1909 Vol 2b Page 102]. He married 2nd to Olga Mary Dickson in 1930 at Bromley, where he described himself as a retired Captain Royal Engineers and an Author [GRO Ref Bromley Kent Sept Q 1930 Vol 2a Page1997]. He died in Italy on the 25 May 1933 [GRO Ref Consular Deaths 1931-1935 Bordighera, Italy Vol 27 Page 182 age56]. In his service record he lists his education as S.E.S. Oxford, France, & Madrid University. 3/3 City of London Regt. : 3 Jul 1915 - 20 Jul 1915? At some stage between 1915 and 1920 he lived in Gough Lines Secunderabad, India. 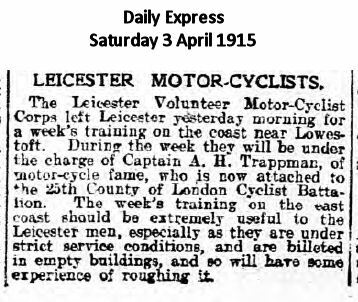 Trapmann was a promotor of the bicycle in warfare, writing and delivering lectures on the subject. He was also the author of a number of articles & books, particularly during the First War. An article in "Cycling" - a weekly journal - 14 Sept 1910 - under the nom de plume 'En Avant' (forward or onward).